If you ever wanted to visit a life-sized replica of Noah's Ark, then you'll soon have a chance at the Ark Encounter in Kentucky. 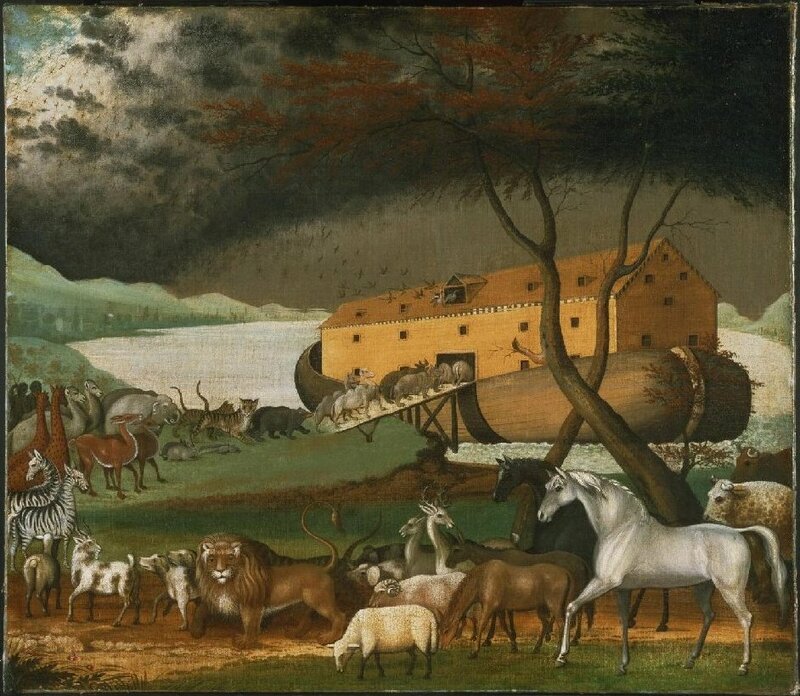 If you want to work on the Ark, then you must be Christian. Wait... what about Title VII's prohibition on religious discrimination in employment? Noah's Ark (1846) by Edward Hicks (public domain). [I]f a tourist attraction, even one that as described here "advances religion," meets the neutral criteria for tax incentives offered by the Commonwealth of Kentucky, can the Commonwealth still deny the incentive for Establishment Clause reasons? This opinion is long but the answer to that question is short -- no. This subchapter shall not apply to . . . a religious corporation, association, educational institution, or society with respect to the employment of individuals of a particular religion to perform work connected with the carrying on by such corporation, association, educational institution, or society of its activities. 42 U.S.C. § 2000e-1(a). The "ministerial exception" includes some easy cases. For example, the Catholic Church can obviously insist that its priests be Catholic. But what about an amusement park like the Noah's Ark Encounter? "[I]n order to invoke the exception, an employer need not be a traditional religious organization such as a church, diocese, or synagogue, or an entity operated by a traditional religious organization." Conlon v. InterVarsity Christian Fellowship, 777 F.3d 829, 834 (6th Cir. 2015) (internal citations and quotation marks omitted). The institution must be a "religiously affiliated entity . . . whose mission is marked by clear or obvious religious characteristics." Id. (internal citations and quotation marks omitted). The applicability of this exception does not need to be tied to an actual church or a particular denominational faith but "applies to multidenominational and nondenominational religious organizations as well." Id. Here, the group behind the Noah's Ark exhibit, is "clearly a religious organization with a particular religious mission." So, it qualifies for the religious exemption. That was a nice little double-win for the Ark Encounter . . . it qualified for the tax incentives while effectively obtaining pre-approval for its religious preferences in hiring.